Would they work for me? Your Invisalign treatment will consist of a series of clear plastic aligners that you switch out about every two weeks. Each aligner is individually manufactured with exact calculations to gradually shift your teeth into place. And since your Invisalign system is custom-made for your teeth and your teeth only, with a plan devised by you and your dentist or orthodontist, you know you’ll end up with a smile that truly fits. Visit us for a consultation to discuss the goals you have for your smile. Once your dentist determines that Invisalign is right for you, he or she will write up a detailed treatment plan, and a set of virtually invisible aligners will then be sent to your dentist. Your Invisalign system may look like a simple piece of plastic, but it’s much more. With advanced technology, your Invisalign aligners are custom-made for you, and only you. Over time, your teeth should move to reveal the smile you’ve been looking for. During this visit, you’ll discuss the issues you have with your teeth and what kind of results you would like to see. Once your dentist decides your situation is suitable for Invisalign treatment, a treatment plan will be mapped out with your goals in mind. Then, impressions and pictures of your teeth will be taken for digitization purposes. The impressions of your teeth will be digitized in order for your dentist to work with a computerized 3-D image of your teeth. Then, your dentist will plan your tooth movements throughout your entire treatment timeline. You’ll be able to see a virtual representation of your teeth before, during, and after completion of the Invisalign process so you can see what your smile should look like when you’re done with treatment. From your dentist’s precise treatment plan, customized aligners are created with advanced technology for you to wear at each stage of your treatment. While the number of aligners varies for each individual situation, a full set of treatment typically includes 20-30 aligners per arch. You should wear your aligners at all times, with the exception of eating and drinking, in order to complete your treatment in the timeline determined by you and your dentist. You’ll go in for occasional checkups, to monitor your progress and to receive your next set of aligners. During the entire treatment process, you’ll be able to watch your teeth gradually moving into place. Your smile will, little by little, move into something you’d like to show off. Not only is Invisalign versatile, helping to correct a broad range of dental and orthodontic issues, but it really works. And there are over half a million smiles to back that up. But a confident smile isn’t the only benefit of correcting your dental issues with custom-made Invisalign aligners—your health can be positively impacted as well. Learn more about several common issues below that an experienced Invisalign dentist can work with you to correct. An Invisalign dentist will work with you to create a custom-designed program that will treat your specific dental or orthodontic issue(s). Your treatment program will consist of a full set of aligners, made for you, and only you. 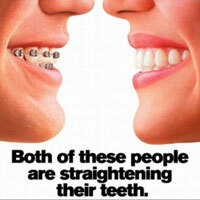 Align Technology, Inc., the company that manufactures Invisalign, was founded in 1997. Since then, Align has manufactured over 18,000,000 aligners and over 890,000 patients have been in treatment. In 1945, Dr. H.D. Kesling envisioned that one day modern technology would enable the use of a series of tooth positioners to produce the kinds of movements required for comprehensive orthodontic treatment. Technology has made this vision a reality. Using advanced computer technology, Align generates Invisalign®, a series of customized clear appliances, called “aligners.” Each aligner is worn sequentially by the patient to produce extensive tooth movements in both upper and lower arches. Worldwide, over 890,000 patients have been treated with Invisalign. The number grows daily. While Invisalign can be used with virtually any treatment philosophy, specific training is needed. All orthodontists and dentists interested in treating patients with Invisalign must attend training before cases will be accepted from their office. Over 35,000 orthodontists and dentists worldwide are accredited to use Invisalign. Invisalign Express is an orthodontic treatment designed to correct mild orthodontic problems such as minor crowding and spacing. Since it’s designed for mild problems only, treatment time is generally less than six months. Ask your Invisalign accredited doctor for more information on this new treatment. Can patients use aligners for bleaching teeth while active tooth movement is occurring? While we are aware that some patients are using aligners for bleaching, Align has not examined the compatibility of currently available bleaching products with our aligners, nor have we demonstrated its efficacy in clinical studies. Align recommends that you consult your orthodontist or dentist for more information on whitening teeth. How often must I see the Invisalign Accredited Orthodontist or Dentist? Your orthodontist/dentist will schedule regular appointments—usually about once every 4-6 weeks. This is the only way your doctor can be sure that the treatment is progressing as planned. This depends on the outcome of the treatment. Some patients might need a positioner, or conventional retainer. Other patients might need a clear plastic retainer similar to the ones Invisalign makes. Discuss these possibilities with your treating orthodontist or dentist. Every patient is different and outcomes vary.